When I am stressed out, I bake or cook. So, watch for lots of baked goods this week. Today was a rough day. Found out that Jon’s wrist (navicular bone) is chipped/fractured. The dr from the urgent care called me back this afternoon and told me that the radiologist read the x-ray and called back right after we left last night. We have an appointment for Jon to see the orthopedic doctor on Wednesday morning. 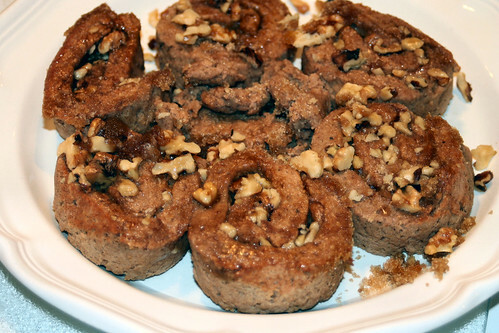 They are darker in color than typical cinnamon rolls for a couple of reasons. One, the mix has cinnamon in it. Second, the mix calls for applesauce (hey, didn’t I just make a bunch of that??) 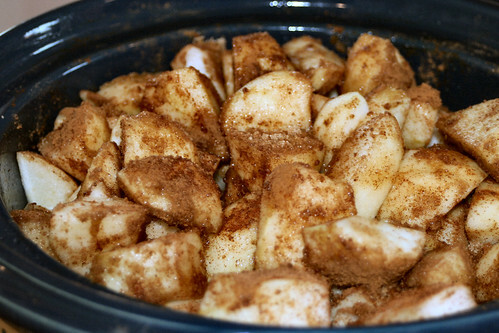 and my homemade applesauce is darker in color b/c of the brown sugar/cinnamon/nutmeg mixture I season it with. 1. Make mix according to directions. 2. Roll out into a rectangle. 3. Grease pan with butter or Pam. 4. 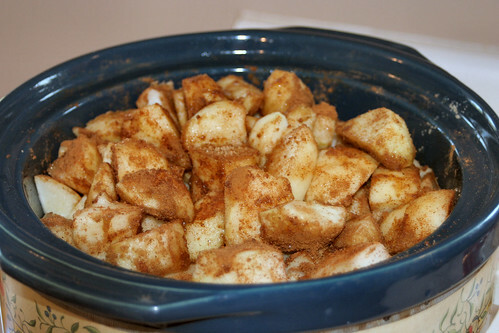 Sprinkle 1/4 cup brown sugar and 1/4 cup walnuts over the bottom of the greased pan. 5. 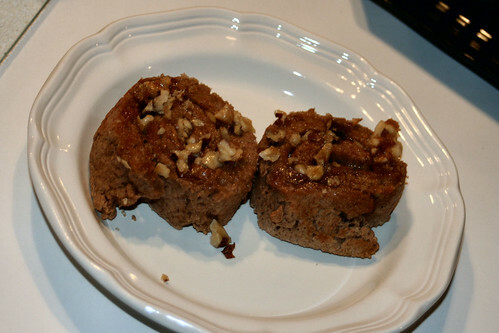 Spray dough with Pam or spread with butter and sprinkle remaining 1/4 cup brown sugar and 1/4 cup walnuts over the rolled out dough. 6. Roll up into a log-like roll. 7. Slice in 1/2 inch slices and place swirl side down in pan. 8. Bake at 350 for 10-14 minutes, checking frequently. 9. Cool slightly, then invert onto a plate. One recipe down, one or 2 more to go for the day. I had to do something to keep my mind (and my fingers off the lap top) off of Jon’s injury. I started them at 10:30 AM and just packaged up my containers at 8:30 PM. Boy did it smell good in here! Fall has fallen. Is that a saying? When it becomes Spring, you hear people saying “Spring Has Sprung” all over. Whether it is a saying or not (which we all know it isn’t 😉 ), I feel as if it has. The air is crisp and cool in the mornings and then it warms up to the mid – high 70s in the afternoon. The perfect weather. The perfect season. The skies are clear blue, no clouds in sight. Ahhhh…… So when my MIL asked yesterday if I wanted to go pick apples with her and Hannah, of course I jumped at the opportunity. What a “fally” thing to do! 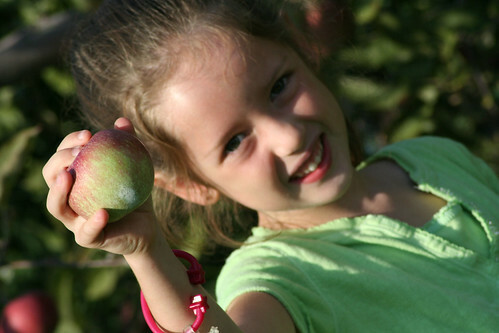 I love the pumkin patch, but I have never done the apple orchard before. I could barely contain myself for the next 24 hours. We headed out around 9:30 this morning. 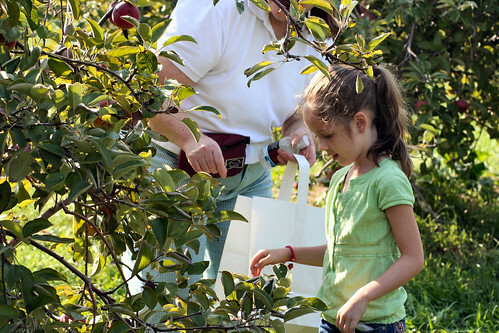 We had plans on going to Lynd’s Fruit Farm, but ended up somewhere else that was much closer. It was also called Lynd’s, but apparently is owned by the brother of the guy who owns the one we intended on going to. I don’t care, I got to pick apples! 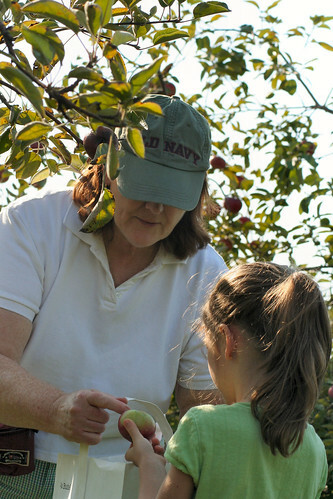 We picked Winesap, Jonathan and Cortland apples. 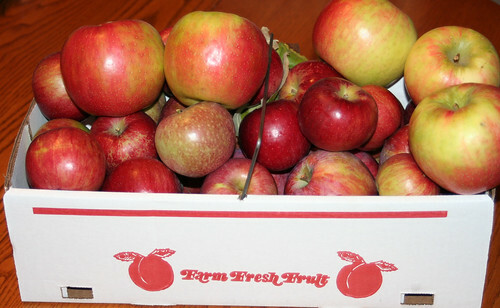 We also purchased some Honey Crisp inside, but weren’t able to pick those. They were delicious!! Very crisp (like their name) and sweet! I also came home with some Cashew Brittle….oh boy…..that stuff is GOOD!! It has 3 ingredients: Butter, Sugar & Cashews. You can bet that I will be making some of this for Christmas this year. Hannah had a blast picking apples with Grandma and I had fun picking and taking pictures. 1. 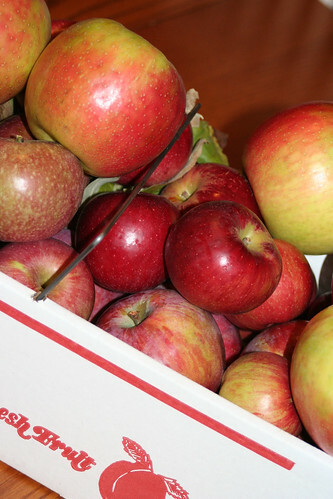 Peel & core apples. Slice into quarters. 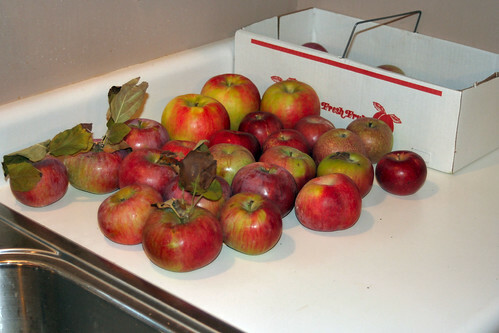 the apples from turning brown. in a blender, but I think even a fork may work. I didn’t get any pictures of it when it was finished b/c I gave some to my neighbor (she was giggling when she found out I was making applesauce from scratch; she asked why I would do that when I could buy it at the store??? LOL). I put the rest in some small containers in the fridge. This probably serves 6-8. If you want more, like I do, double or triple the recipe. I used a 4 qt crock pot and had plenty of room for more. I plan on making a significant amount over the next week now that I know the spices are right where I want them. It was a beautiful way to kick off the fall season. On tap this coming week, more applesauce, apple crisp and maybe some Sour Cream Apple Cake, recipe by Karina from Karina’s Kitchen.